Talen, your photos are pushing me to head up north to see the sites. Thank you for posting this. 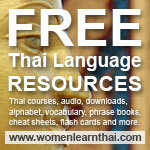 .-= Catherine´s last blog ..My 30 Day Thai Language Trial: Week One =-. Cat, You definitely should head up north for a trip I think you’d like it. Much different than the touristy regions. I don’t get around the touristy regions much (beaches and loads of people are not my thing) so North would suit me fine. Talen I’ve only been home a few hours and yet your photos are making me pine for Udon Thani. Love the face in the top photo and the buffaloes and rural bus remind me of village life. Lots of snow on the ground here in the UK and it’s freezing. .-= Martyn´s last blog ..Travelling Thai Style With An Old Friend =-. Glad to hear you made it home safe Martyn…although I’m sure you’re not glad to be back. Have snow and it’s freezing here too so at least you know you’re in good company.